Posted on: April 1st, 2019	by Jennifer A. Okay friends, it’s time! That’s right, summer is just around the corner and it is time to start planning all of the great things that you are going to be doing! 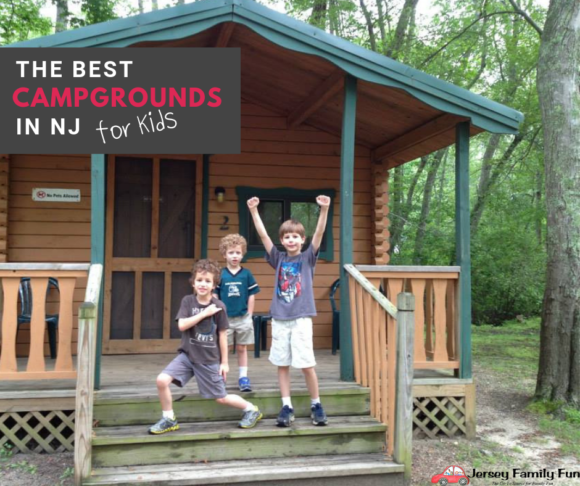 If an epic camping trip with kids is on your list, this list of over the best 25 campgrounds for kids in or near New Jersey is the perfect place to start planning your trip! 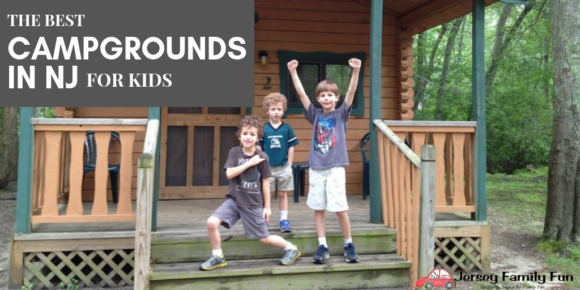 What makes a New Jersey campground great for kids? When we were searching for campgrounds in and near New Jersey there were a few tings that were very important to me. First, we wanted campgrounds that offered traditional tent sites and RV hook ups, but we also wanted cabins that could sleep anywhere from 4 people to 7 people. The onproperty amenities were just as important to us as whether or not the local area had plenty of things to do. Because sometimes when you’re camping you want to explore family attractions in the area. Other times you want to chill at the campgrounds taking advantage of pools, courts, and special activities. So whether you are looking for a campground in New Jersey or near New Jersey we have you covered. If you’re looking to explore campgrounds with plenty to do where you camp or nearby your campsite, we have you covered. We’ve even made sure to break it into locations for you to make it easier to find the campgrounds near the locations you want to visit this summer. For each location, we’ll also provide you with a short list of things to do near the campsite. Who is ready to go camping? The Delaware River Family campground near Columbia is a great campground choice if you love river camping. You can tent camp or rent a cabin (they have both modern and more authentic style cabins available). Here you will find such kid friendly amenities as 2 swimming pools, a game room, boat and tube rentals, basketball courts and even mini-golf! You will also find lots of scheduled activity nights! The Delaware River Family Campground is located in Columbia. For more information about Delaware River Family Campground call 800-543-0271 or visit their website at www.njcamping.com/delaware. Pequest Trout Hatchery in Oxford is a state park site offering information about how trout are raised, hiking trails, and other special events. Visit their website here. Franklin Mineral Museum in Franklin NJ is a hidden treasure of Sussex County, focusing on the history of this once mining district. Explore fossils, American Indian artifacts and fluorescents. Visit their website here. The High Point State Park near Sussex will be super fun for the whole family. Here you will find tent sites as well as cabin rentals. Kid friendly amenities here include lots of hiking trails, lake swimming for the summer and cross-country skiing skiing in winter. The High Point State Park is located in Sussex. For more information about High Point State Park call -973-875-4800 or visit their website at www.state.nj.us/dep/parksandforests/parks/highpoint.html. Hit the ice at Skylands Ice World, offering open skate and a Friday night “ice jam.” For more information visit their website here. Solve It Escape Rooms in Vernon will bring out the competitive nature in your group! Choose from four rooms with varied problems to solve. Find out more at their website here. Wild West City is like no other attraction! Open seasonally with live shows, train ride, recreated stores and more it is a must see in northern New Jersey. For more information visit their website. Spruce Run Recreation Area features hiking and biking trails, swimming with lifeguards, fishing, playgrounds, sports fields, and more! Here you will find tent sites as well as RV sites. The Spruce Run Recreation Area is located in Clinton. For more information about Spruce Run Recreation Area call 908-638-8572 or visit their website at www.visitnj.org/nj-all-beaches/spruce-run-recreation-area. Somerset Patriots minor league baseball – from April to August, catch a game at TD Bank Ballpark in Bridgewater. The Somerset Patriots have a family friendly schedule with promotions, reasonably priced tickets and food, and more. Find out game schedules and more at their website. Red Mill Museum Village in Clinton is a picturesque building with exhibits focusing on local history, and hosts special events throughout the year. Learn more at their website. The Readington River Buffalo Farm is open weekends to visitors who want to see the buffalo roam free right in Hunterdon County! Explore more at their website here. The Pleasant Acres Farm Campground near Sussex is a campground located on a real working farm. Here you can take a horse-drawn hayride, pet baby animals, milk cows, shear sheep, chase pigs and more farm related fun. You will also find a swimming pool, mini golf course, sports fields, fishing lake, live bands, dance parties and more! This one has it all! The Pleasant Acres Farm Campground is located in Sussex. For more information about Pleasant Acres Farm Campground call 973-875-4166 or visit their website at www.pleasantacres.com. Sussex County Sunflower Maze – These blooming beauties appear from mid-August to mid-September. Located in Sandyston, it offers pick your own, a scavenger hunt, and more. There are over 1.5 million sunflowers to gaze upon! Visit their website here. We don’t recommend you hike the entire Appalachian Trail but 72 miles of it does run through New Jersey! There are multiple access points along the northern border of the state. Detailed information is available here. Take it back to the old days of the drive in theater at the area’s only remaining drive in! The Warwick Drive In in Warwick NY is open seasonally and shows the latest and greatest! Check out their website here. At Kymer’s Camping Resort, near Branchville, you will find an amazing array of amenities such as foosball, mini golf, ping pong, tennis, volleyball, basketball, swimming pool, kayaking, craft activities, DJ dance parties and more. Oh, and for us parents they even have paint and sip parties! If this is not enough entertainment for you, the campground is quite close to the New Jersey state fair, Wild West City and more great New Jersey landmarks. The Kymer’s Camping Resort is located in Branchville. For more information about Kymer’s Camping Resort call 800-526-2267 or visit their website at www.njcamping.com/kymers/index.htm. Space Farms Zoo & Museum – Open seasonally, this Sussex attraction houses over 500 animals and museums that showcase Native American materials, tools, automobiles, and a hand built train set. Be sure to check their calendar for many yearly special events, their website can be found here. Sterling Hill Mining Museum – Open year round for public tours with varied hours, this is a fun excursion with an underground mine tour, displays of minerals and other special events. Dress warm, that underground mine gets COLD! For more information check out their website here. Mountain Creek Waterpark – This outdoor waterpark has over 20 rides and slides, and is sure to thrill all ages. Find out more in our review, 5 Things You Need to Know About Mountain Creek Waterpark, link here. The Harmony Ridge Campground near Branchville is a family friendly campground that is open year round. Here you will find cabin rentals and tent sites. For the kids you will find a playground, basketball court, paddle boats, hockey rink, swimming pool and more! Don’t worry about those snack attacks either, they have a snack bar available and they even serve breakfast! The Harmony Ridge Campground is located in Branchville. For more information about Harmony Ridge Campground call (973) 948-4941 or visit their website at campnj.com/campgrounds/harmony-ridge-campground. Land of Make Believe – this amusement and water park in Hope, New Jersey opens for the season Memorial Day weekend. 30 acres offers rides for all ages especially the little ones. Bring a picnic or buy food on premises. Allaire State Park near Howell is great for families that love history! The park itself is quite well known for the Pine Creek Railroad (featuring an actual working antique steam train!) located within and the 19th-century iron-making village that is there as well. This park has an awesome hiking trail system, boaters and fishermen will enjoy the access to the Manasquan Reservoir. Here you will find tent sites and cabin rentals. Allaire State Park is located in Howell. For more information about Allaire State Park call (732) 938-2371 or visit their website at www.state.nj.us/dep/parksandforests/parks/allaire.html. You may find these animals hanging out at the Allaire State Park during your family’s visit. Jenkinson’s Aquarium and Boardwalk – Arcades, an aquarium, the beach and rides are just some of what you can find at the popular Jenkinson’s Boardwalk in Point Pleasant. Read our review of Jenkinson’s Aquarium here. National Guard Militia Museum located in Sea Girt is open daily and offers interior exhibits along with exterior vehicle and aircraft displays. Admission is free! For more information visit their website here. The Turkey Swamp Park in Freehold features a large lake that is enjoyed by fishermen and boaters, you will also find playgrounds, hiking trails and even an archery range. You can rent one of three cabins or you can rent a regular campsite. Turkey Swamp Park is located in Freehold. For more information about Turkey Swamp Park call 732-462-7286 or visit their website at www.monmouthcountyparks.com/page.aspx?Id=2522. Visit the indoor amusement park and boardwalk that is iPlay America. Located in Freehold, iPlay America offers the excitement of indoor rides and attractions sized to fit nicely in nearly 4 acres of family fun. Race speedy go karts, fly through the air on the Kite Flyer, ride the Skyscraper, bump the bumper cars, and play 2-level laser tag. Rain or shine you can do it at iPlay. You can even eat like you would on the Boardwalk with Sonny’s Boardwalk Grill for Jersey Shore-style hot dogs, cheesesteak sandwiches, funnel cakes, and more. Live music and family-friendly events happen every week. Admission is always free. Pay as you go or purchase a wristband for a day that’s guaranteed to be packed with fun. Learn more about iPlay America at their site. For a list of upcoming events at iPlay America visit our Upcoming iPlay America Events and Concerts article. 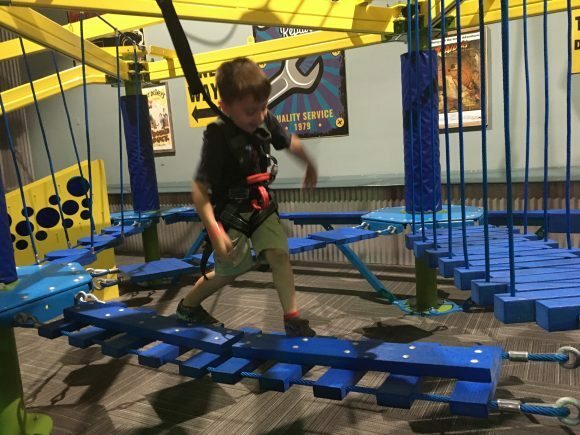 Climb across the Sky Tykes Ropes Course at iPlay America. Wander the fields of the Monmouth Battlefield State Park and be transported back to the days of Molly Pitcher, but first visit the detailed visitors center with an impressive 10 minute film that explains the history of the battle waged on the land. Read more in our article, Stepping Into History at Monmouth Battlefield State Park. If bad weather plagues your camping trip there’s fun to be had at the Freehold Raceway Mall – food court, Apple and Microsoft Store, movie theater, an indoor carousel and pet adoption center offers something for everyone. Find out hours and more details at their website here. The Butterfly Camping Resort in Jackson has been operating for more than two decades and the owner’s dedication shows. Amenities here include pony and wagon rides, game nights, arts and crafts, playground, arcade, sports fields, outdoor movie nights, swimming pool, mini golf course, and more! Here you can rent a regular tent site or a cabin or cottage. Not enough entertainment for you? Six Flags Great Adventure & Safari is just 6 minutes away! Butterfly Camping Resort is located in Jackson. For more information about Butterfly Camping Resort call 732-928-2107 or visit their website at www.butterflycamp.com/index.html. 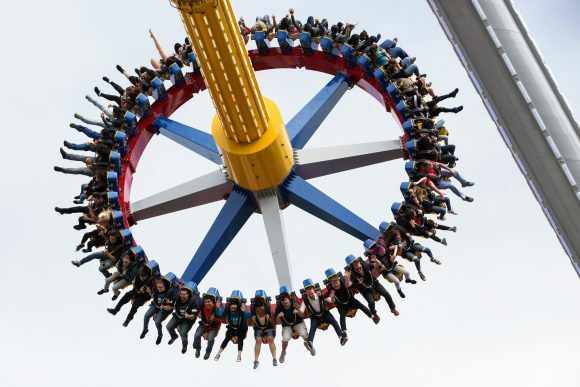 Experience Six Flags Great Adventure! For extreme roller coasters, wild water rides and chances to hang out with the Looney Tunes characters work a visit to Great Adventure into your Butterfly Camping Resort plans. This summer the 510-acre theme park will debut Wonder Woman Lasso of Truth, the world’s tallest pendulum ride! Read about it here. Learn more about Great Adventure on their site. You may not be brave enough for Wonder Woman Lasso of Truth, but there are plenty of other rides to thrill you at Great Adventure. Manasquan Reservoir spans 770 acres and is a popular destination for walking, fishing, and kayaking. Young kids love the environmental education center, check their website for special events hosted by Monmouth County Parks. Read more in our review, Explore the Manasquan Reservoir. Get Air Trampoline Park in Freehold gives everyone a place to burn off energy and defy gravity! They offer special hours for toddlers and teens and extended open jump hours. Check their website for hours and deals. Yogi Bear’s Jellystone Park Campground in Elmer is a place that all families in New Jersey should go to at some point! This campground is located on over 100 wooded acres, and features such fun amenities as a splash pad, swimming pool, event themed weekends and more! Here you can rent tent sites, RV sites or cabins! Yogi Bear’s Jellystone Park Campground is located in Elmer. For more information about Yogi Bear’s Jellystone Park Campground call 856-451-7479 or visit their website at www.abcamping.com/tallpines. See the animals at the Cohanzick Zoo, New Jersey’s first zoo, that began more than 60 years ago and displays more than 100 animals in modern naturalistic exhibits. The Cohanzick Zoo is open daily 9:00 am -5:00 pm. There are a variety of animals in exhibits including ring tailed lemurs, a gibbon, Asiatic bear, tigers, llama, African porcupine, as well as water fowl and peacocks roaming throughout the zoo. Admission is always free. Learn more about the Cohanzick Zoo at their website. 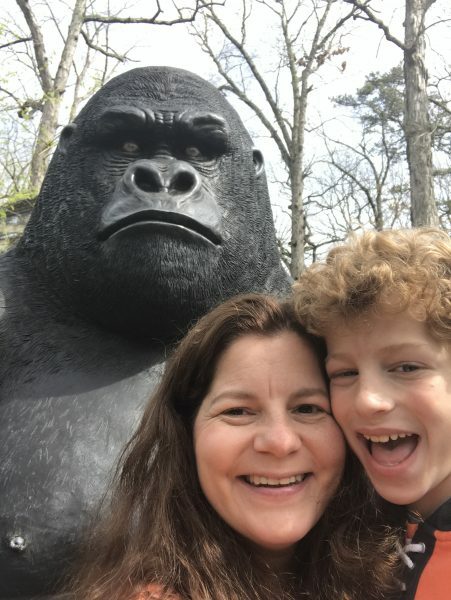 Take a Cohanzick Zoo selfie with this primate. Looking for more swimming? Parvin Lake in Parvin State Park, Pittsgrove is a popular destination. The park also allows boating, hunting and picnics. For more information visit the NJ State Parks website here. Finns Point Lighthouse in Supawnee Meadows NWR has limited visiting hours but the refuge is open and popular for bird watching. Check their website for more details. At the Four Seasons Family Campground in Pilesgrove, you will find a swimming pool, playgrounds, sandy beach, game room, sports fields, fishing opportunities, and lots more! Four Seasons Family Campground is located in Pilesgrove. For more information about Four Seasons Family Campground call 856-769-3635 or visit their website at fourseasonscamping.com/programs.html. Wood Lanes in Pilesgrove is the place to bowl in Salem County! Late hours, discount games and Christian Rock and Bowl are just some of the special events offered. More details on their website here. The Historic Hancock House dates back to 1734 and is now maintained by the NJ Division of Parks. Admission is free but call ahead to confirm hours. Find out more at their website here. Cowtown Rodeo is the only New Jersey rodeo and the longest running weekly rodeo in the country. Don’t miss the twice a week farmers market on the property as well. For hours and admission information visit their website here. The Adventure Bound Camping Resort Cape May brings together beach time and camping! Here you will find amenities such as swimming pools, a water slide, outdoor movie theater and even bouncy houses! Adventure Bound Camping Resort is located in Cape May. For more information about Adventure Bound Camping Resort call 609-465-4440 or visit their website at www.abcamping.com/abcapemay. 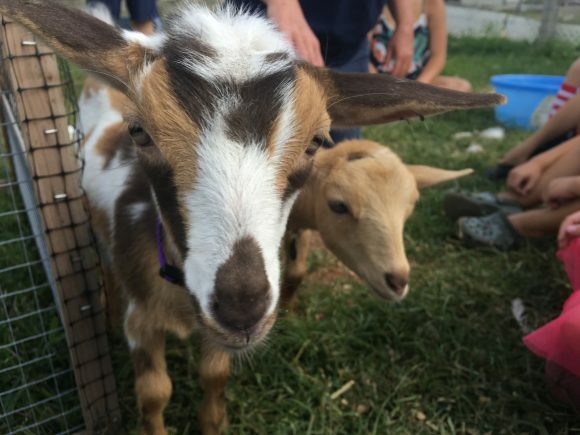 Kids love animals and there’s nothing better than a free New Jersey zoo, like the Cape May County Park & Zoo to take them to visit and learn about different species and their habitats. Not only is it free, but it’s close to the Adventure Bound Camping Resort Cape May. There’s a large variety of animals from all over the world, including 550 animals representing 250 species. Each animal exhibit is labeled with a colorful and informational sign so visitors can learn more about them. Some are designated as part of Zoo Species Survival Plan (SSP) and let visitors know what the Zoo is doing to protect these endangered species. The nearby playground is a great place for a picnic or to run off any excess energy the kids may have. Learn more about the Cape May County Park & Zoo on their website. 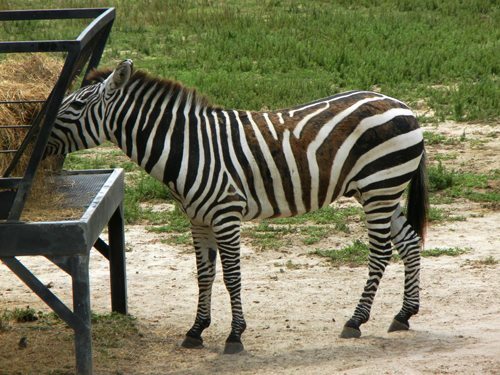 A zebra grazing at the Cape May County Zoo. Head to sea to see the dolphins and whales! Our trip on the Cape May Dolphin and Whalewatcher Cruise was a success in seeing dolphins. Kids 6 and under ride free! 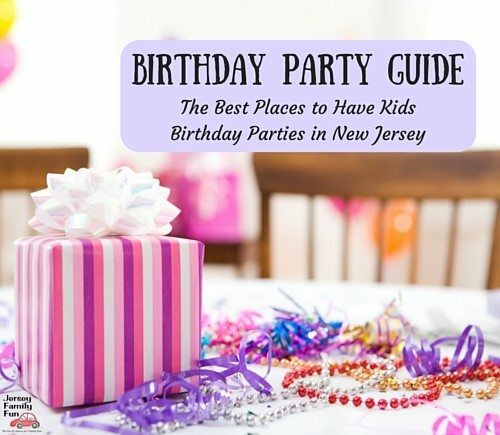 Find out more in our article, 10 Things to Do With Kids in Cape May. The Cape May Lighthouse at Cape May Point State Park is a must do! Climb all 157 feet then take a hike in the scenic park while you look for birds – guided walks are available. For more information check out our article Cape May Lighthouse. The Baker’s Acres Campground in Little Egg Harbor offers a multitude of ways for families to have fun. With a playground, swimming pool, sandbox, arcade, ball field, horseshoes, and volleyball your kids will never be bored. Baker’s Acres offers tent camping, basic and deluxe cabins, cottages, and hook up sites for RVs. For more information about the Baker’s Acres Campground read about our experience, Our Wet & Wild Weekend at Baker’s Acres Campground, call 609-296-7400 or visit their website at bakersacres.com. 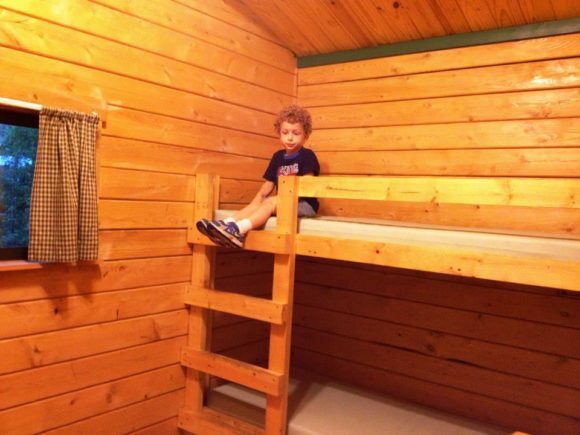 The Baker’s Acres Campground bunk bed offers 3 beds. Click over to our story for more details. The Sea Pirate Campground in West Creek offers fun, kid-friendly amenities such as playgrounds, canoeing, kayaking, sports fields, swimming pool, family activities and more. At this campground you will find tent camping sites as well as cabin rentals. Sea Pirate Campground is located in West Creek. For more information about Sea Pirate Campground read about our experience here, call 609-296-7400 or visit their website at sea-pirate.com. 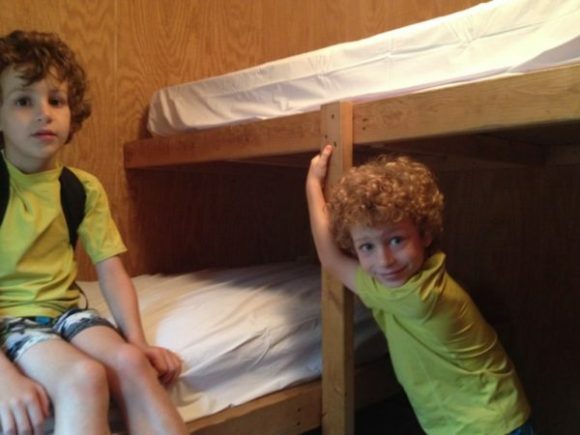 Who will take the top bunk when your family visits the Sea Pirate Campground? Cick over to read about our experience. The Wading Pines Camping Resort in Chatsworth you can find some really amazing amenities such as a salt water pool, fishing pond, tennis courts, basketball courts, the “Jersey Train” (a train ride that will take you for a ride throughout the scenic campground) and more! Wading Pines Camping Resort is located in Chatsworth. For more information about Wading Pines Camping Resort call 888 726-1313 or visit their website at wadingpines.com. Coming soon details about Diggerland USA, Sahara Sams, and more family attractions near the Wading Pines Campground. The Ocean View Resort Campground is the largest privately owned campground in all of New Jersey. Amenities here includes a splash pad, swimming pool, fishing pond, playgrounds, arcades, mini golf, sports fields, boating and swimming lake, and a store that sells deli food for those times when you don’t want to cook over the campfire. Ocean View Resort Campground is located in Ocean View. For more information about Ocean View Resort Campground call 609-624-1675 or visit their website at www.ovresort.com. Roasting marshmallows at Baker’s Acres. Amenities at the Lake Kandle Campground in Washington Township include multiple pools, a lake for boating, and weekly special activities. RV camping only. Lake Kandle Campground is located in Washington Township. For more information about Lake Kandle Campground call 756 589-2158 or visit their website at lakekandle.com. Camp the Pinelands at the Turtle Run Campground in Egg Harbor City! Offering tent and RV and cabin camping, with a large playground, mini golf, arcade, movies and more. Turtle Run Campground is located in Egg Harbor City. For more information about Turtle Run Campground call 609-965-5343 or visit their website at turtleruncampground.com. The Knoebels Campground in Elysburg, PA is a great place to stay if you plan to head to Knoebels Amusement park, since they are right next door to one another! You can rent a tent site or a cabin and camp while you prepare for your day at the park! Knoebels Campground is located in Elysburg, PA. For more information about Knoebels Campground call 570-672-9555 or visit their website at www.knoebels.com/stay/knoebels-park-campground. Coming soon with details about Knoebels Amusement Park and other family attractions near Knoebels Campground. Yes, it is another Jellystone Park! This one is located in Quarryville, Pennsylvania and offers many amenities that the entire family will love. Here you will find tent sites, RV sites or cabins for camping. You will also find a splash pad, water zone, jumping pillow, swimming pool and so much more. Yogi Bear’s Jellystone Park is located in Quarryville. For more information about Yogi Bear’s Jellystone Park call 717-610-4505 or visit their website at jellystonepa.com. The Circle M RV campground near Lancaster features a western-themed setting and is located right in the middle of Amish Country and is one of the largest resorts in the Thousand Trails Network. This resort features awesome family friendly amenities like pickleball courts, basketball, swimming pool, hot tub, playgrounds, horseshoes, mini golf and more. Circle M RV & Camping Resort is located in Lancaster. For more information about Circle M RV & Camping Resort call 877-570-2267 or visit their website at www.rvonthego.com/pennsylvania/circle-m-rv-camping-resort. The Elizabethtown/ Hershey KOA campground has been called a favorite family campground in the area and is quite close to some of the areas hottest attractions such as Hershey Park and Amish country. As far as amenities, you can find a swimming pool, mini golf, snack bar and more. Elizabethtown/ Hershey KOA campground is located in Elizabethtown. For more information about Elizabethtown/ Hershey KOA campground call 717-367-7718 or visit their website at koa.com/campgrounds/elizabethtown. 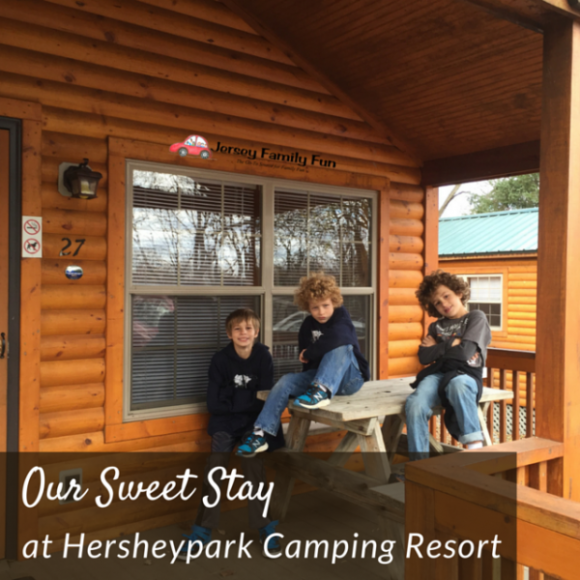 It may have been a few years since we’ve staye at the Hersheypark Camping Resort but we still have sweet memories about it. The deluxe cabins are spacious enough for a family with a few kids. And when you’re not at Hersheypark, the campgrounds offer plenty of activities like multiple playgrounds, pools, an arcade, special events and more. Hersheypark Camping Resort offers deluxe cabins that sleep 7, 1 bedroom and 2 bedroom, log cabins that sleep 4 – 6 and sites for tent and RV camping. The Hersheypark Camping Resort campground is located in Hershey, Pennsylvania. For more information about the Hersheypark campground, read about our experience, Our Sweet Stay at Hersheypark Camping Resort, call 717-534-8995 or visit their website at www.hersheyparkcampingresort.com/accommodations. Coming soon with details about Hersheypark Amusement Park and other local Hershey attractions. The Drummer Boy Campground is a Pennsylvania campground in historic Gettysburg, Pennsylvania. Drummer Boy Camping Resort offers families modern amenities such as mini-golf, game room, whirlpool spa, two swimming pools, 250′ water slide and much more in a historical setting. The Gettysburg campground offers rv sites, cabins and cottages. For more information about Drummer Boy Campground call 717-334-3277 or visit their website at drummerboycampresort.com. At Camp Getaway near Staten Island you will find surf fishing, swimming (when lifeguards are on duty), kayaking, biking (bike rentals available nearby), playgrounds, and more. Camp Getaway campground is located in Staten Island. For more information about Camp Getaway call 718-354-4655 or visit their website at www.recreation.gov/camping/campgrounds/234715. At Hither Hills State Park near Montauk you will find a beach (summertime only), a 40-acre lake, playground, sports courts, hiking trails and more. Hither Hills State Park is located in Montauk. For more information about Hither Hills State Park call 631-668-2554 or visit their website at www.reserveamerica.com/explore/hither-hills-state-park/NY/297/overview. Malouf’s Mountain near Beacon is the perfect camping destination for families that don’t camp very often. You can hop the train right to a hiking trail that leads you to the campground. You don’t even need any food or camping equipment! They will provide you with everything you need! Malouf’s Mountain is located in Beacon. For more information about Malouf’s Mountain call 845-831-6767 or visit their website at www.maloufsmountain.com/campground. At the Eastern Long Island Kampground you will find tent sites as well as sites suitable for RVs of all types. Amenities here include a swimming pool, campground store, game room, playground, hosted activities and more. Eastern Long Island Kampground is located in Greenport. For more information about Eastern Long Island Kampground call 631-477-0022 or visit their website at www.easternlikampground.net. The New York City North Newburgh KOA in Plattekill is a great family camping destination near the city. Amenities here include a fishing pond, two swimming pools, a climbing wall, jumping pillow, mini golf, basketball court, outdoor theater, fire truck rides and more! During the summertime you will also be able to enjoy espresso, and ice cream treats! New York City North Newburgh KOA campground is located in Plattekill. For more information about New York City North Newburgh KOA campground call 845-564-2836 or visit their website at koa.com/campgrounds/newburgh. Another KOA campground, near New Jersey, to add to the list, the Deer Park New York City NW KOA is a great family friendly campground thanks to its extensive list of amenities, such as a swimming pool, jumping pillow, bike rentals, wagon rides, slides, playgrounds, mining sluice, and more. Deer Park New York City NW KOA campground is located in Elizabethtown. For more information about Deer Park New York City NW KOA campground call 845-754-8388 or visit their website at koa.com/campgrounds/deerpark. 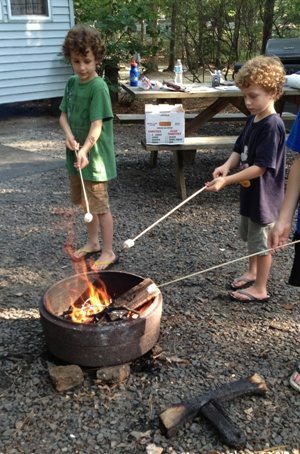 Have you been to any amazing campgrounds for kids in or near New Jersey that you would like to share with us?